Whenever life gets too heated, head south to Encinitas until things cool down, even if just for a day. Denizens of Los Angeles and Hollywood began seeking solace here in the early 20th century. The soothing effects can still be had in the 21st, especially if you start your trip with the three swamis. In 1920, Indian yogi Paramahansa Yogananda founded the Self-Realization Fellowship (939 Second St., Encinitas, 760-436-7220; www.encinitastemple.org) with a temple and hermitage on a bluff overlooking the sea. There, he wrote Autobiography of a Yogi (1946), a spiritual-adventure tale that was instrumental in bringing yoga and eastern philosophy to the States. In 1966, sitarist Ravi Shankar, who lived in the town in a house his family still occupies, gave the book to George Harrison, who absorbed it thoroughly before passing the book along. Yogananda’s guru’s guru predicted the West’s fascination with yoga long before the Encinitas-based swami was born. Today, the public can stroll through the Meditation Garden (215 W. K St., Encinitas, 760-753-1811), where his Golden Lotus Temple once stood, to hear chatty visitors and bird song, as well as view silent meditators among the koi ponds, waterfalls, benches and views from the cliff-top of the beach below. In the 1960s, surfers nicknamed the break Swami’s (1298 S. Coast Hwy. 101, Encinitas) in Yogananda’s honor; now it’s official. If visiting those two swamis doesn’t quite refresh, it’s time to cross the road to Swami’s Café (1163 S. Coast Hwy. 101, Encinitas, 760-944-0612; swamiscafe.com) for a belly-filling breakfast before you rest on the sand. Beaches that back up to sky-high cliffs have hundreds of steps to climb on the way back up, and Swami’s is no exception, but it’s worth the workout to watch surfers from around the world at the renowned, crowded spot. Swami’s reef is one of California’s Marine Conservation Areas, with 12 protected habitats. At low tide, the nearshore reef teems with brittle stars and sea hares, but be cool or you’ll get inked. Leave only your footprints; take nothing. 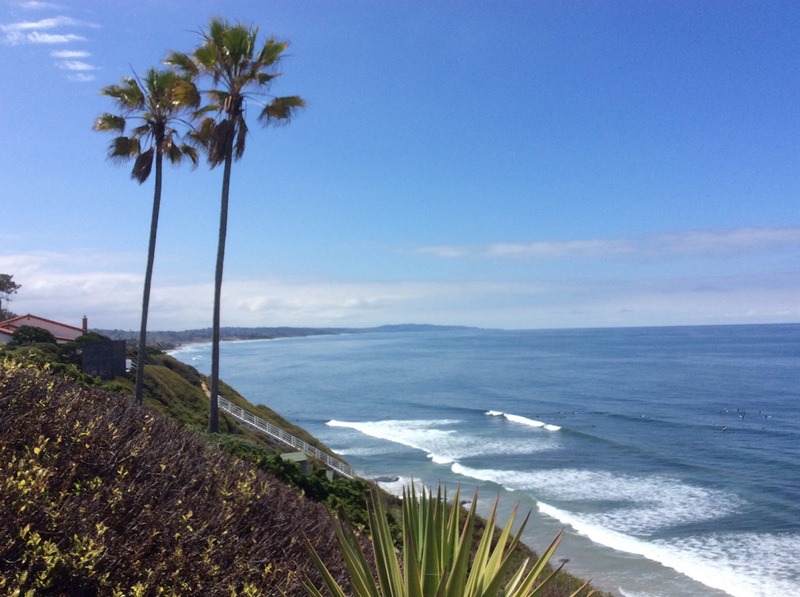 For swimming, bodysurfing and all kinds of kids’ play, the easily accessible Moonlight State Beach (400 B St., Encinitas) is the perfect option. 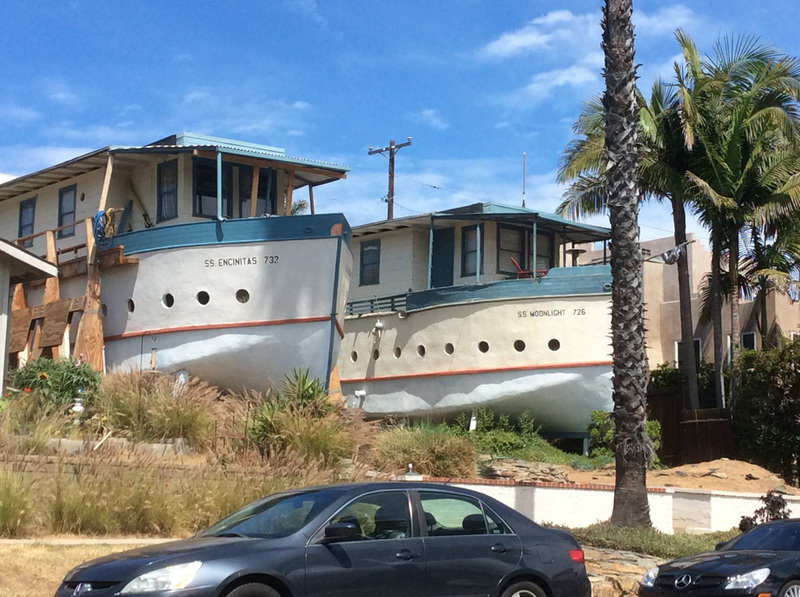 From the three-swami zone, take Third Street north so you can snap a shot of the twin boat houses, S.S. Moonlight and S.S. Encinitas (726 and 732 Third St., Encinitas), built in 1927 and ’28 by Miles Kellogg from the wooden planks of a defunct dancehall. Young or old, Moonlight Beach has everything beachgoers want: lifeguards on duty, snack bars, rentals, bathrooms and showers, fire pits, playground, grass. Though don’t do your laundry where Cottonwood Creek meets the beach, as turn-of-the-century settlers did. Women cleaned the clothes before spreading them out on rocks, enjoying picnics with their families during the dry cycle. In the 1920s, horse races took place at low tide—at least until Del Mar Racetrack opened in 1937—and Model T’s raced toward finish lines as far away as Oceanside. Today, beaches have shrunk, and a treatment facility keeps the creek from spoiling Moonlight’s waters. “There is great value in visiting places where saints have lived,” wrote Yogananda. “Such places are forever permeated with the vibrations left there by the divine souls who walked those grounds. Their vibrations will remain until this earth is dissolved.” If you define saints as humans with otherworldly talent, Charlie Chaplin; Mary Pickford; and musicians Shankar, Eddie Vedder and Harry Partch all lived in Encinitas. Vedder went to high school there and has been known to pop in for a set at school fundraisers. 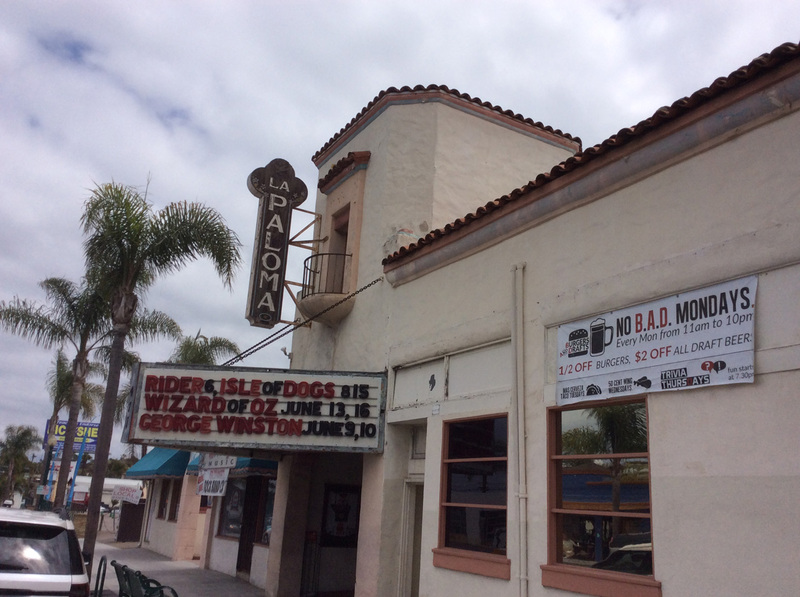 Jerry Garcia played La Paloma Theatre (471 S. Coast Hwy. 101, Encinitas, 760-436-7469; www.lapalomatheatre.com). A cornerstone of town life, “The Dove” runs indie, surf and retro films, as well as Rocky Horror; it also hosts concerts and community events. Opened in 1928, when it was equipped to screen cutting-edge talkies, the building is a bit of a crumbling beauty, to borrow a phrase from Tom Waits. Watch a $10 flick (cash only at the box office) while traffic dies down after spending some time boulevarding downtown Encinitas’ Coast Highway 101, where dry-cleaners and squirt-your-own car washes can still be found despite the startling wealth of the place. For old time’s sake, step into The Saloon (546 S. Coast Hwy. 101, Encinitas, 760-753-1366; www.saloonencinitas.com), which has been pouring since 1934 and considers itself a dive. But what self-respecting dive bar takes booth reservations? The true dive is O’Hurley’s Beach Bar, deep in the heart of Encinitas’ funky Leucadia neighborhood. But exploring that side of town (including a breakfast burrito with plantains inside!) is for the next much-needed escape. Lisa Black proofreads the dead-tree edition of the Weekly and writes about the arts and South County beaches. Her OC roots go back to the Cuckoo’s Nest but she left to create original theater on four continents, then returned to bodysurf small waves.